The SUTHERLAND® 2000 “Dual” Tester provides the same robust functionality of a single tester while adding the ability to test two specimens side by side. This allows exact duplication of speed and resistance when comparing test results simultaneously. 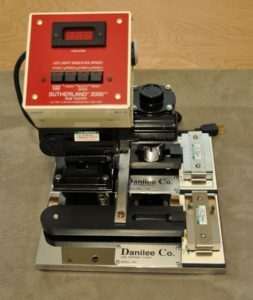 When a large amount of testing is to be completed, the SUTHERLAND® 2000 “Dual” Tester provides a timely application as well as maintaining a reasonable budget short of requiring two separate testing units. 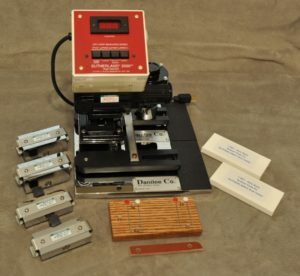 It also provides more flexibility within the test; for example you can run a test using a 2-lb and 4-lb weight at the same time or different receptors on each weight to compare how different abrasive surfaces affect the test specimen. Each SUTHERLAND® 2000 “Dual” Tester comes with two (2) 2-lb and two (2) 4-lb weights, a scoring fixture, and two (2) sets of replacement pads. Refer to our options section for additional items available or contact us today for more information.